What Does It Mean To Put a Demand on God? 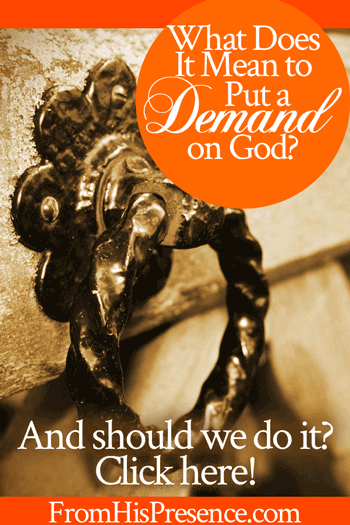 Have you ever wondered what it means to put a demand on God? I received this wonderful question from a reader recently. The reader had seen one of my blog posts encouraging you to “put a demand on God in prayer,” and he wanted clarification about what on earth I meant! It’s a great question. So, in case others are wondering the same thing, I thought I’d share my response here. Putting a demand on God means to pray in insistent, demanding faith. It means to demand, in prayer, that He give us what He says in His Word we can have. Then the Lord said, ‘Hear what the unjust judge said. And shall God not avenge His own elect who cry out day and night to Him, though He bears long with them? I tell you that He will avenge them speedily. Nevertheless, when the Son of Man comes, will He really find faith on the earth? '” (Luke 18:1-8). In the passage above, Jesus taught us that insistent, demanding prayer gets results. In fact, He indicated that He calls this type of praying “faith,” and He wondered if He would find it on the earth when He returns. The easiest Biblical illustration I know is to look at Mary, the mother of Jesus, and what she did at the wedding at Cana. Here’s a link to a post in which I write about that. Also, the post discusses Abraham and others. Please be sure to read it in detail! Jesus also taught us to put a demand on Him in faith in many other places. Think of the woman with the issue of blood, who put a demand on God for healing by touching Jesus’ robe without permission. She was healed–and Jesus said that her faith had made her whole. Think of the lepers and blind people … so many that Jesus healed. They all refused to be denied, because they knew who Jesus was and what He could do. You put a demand on God when you pray insistent prayers … and you keep praying until you get what you’re asking for. It’s all based on what God’s Word says He wants to give you and do for you. You have to know what God’s Word says. And you have to pray in faith, based on what His Word promises, if you’re going to get anything from God. And as long as you know what His Word says, anything promised to us in that Word is always His will for all of us. However, we have to go to Him in prayer and ask for it, sometimes repeatedly, in order for His will to be released on the earth. Basically, demanding prayer is insistent prayer. And insistent prayer is the prayer that believes God means what He says, and that is determined we’re not going to give up asking until we see His will done on the earth and in our lives. What are you putting a demand on God for today? This message is solid gold. Exactly how I see it as well. Prayers without ceasing. He delights in this from His children. For when our prayers are aligned with His word, our Father knows we enjoy learning the truth of His word. Thank you Sister. I’ve heard people say you can’t tell God what to do, but your doing what Jesus is telling you to do, don’t lose faith in the last days. We need to be desperate to recieve God’s promise in prayer and not allow fear dictate to us. Thank you for the reminder that our persistent prayer is not a result of lack of faith but on the contrary. Great post!!! This weekend we had a powerful anointed man of God speaking at our church during a 3 day conference. God is a miracle worker! I will try to keep this short, and to the point. I had just asked my husband yesterday, How do you pull on God? I received a simple answer. He said, just ask in faith. This true prophet of God, whom we did not know, was calling out people by name, first and last, their birthdates, anniversaries, their children names, and siblings, etc. He began on Friday, and each nite the services were elevated. My husband is a minister & always receives a prophetic word from the Lord. So on Friday, I prayed, “Lord, I am standing in the need of prayer’. On Saturday, I prayed, Lord, I need a word from You. Sunday morning, I prayed, Lord, don’t forget about me. Sunday night was the last service meeting, and I arrived late. I was praying in the Spirit believing God would not forget about me. I missed all the praise and worship b/c I was really late. The place was standing room only, but I found 1 seat all the way in the back, then I heard the man of God say, is there a Patricia in here. He said if you are, come quickly to the front. I went up and there was another lady named Patricia too. Then he said I believe the last name is McNeal, that did it for me!! We have a book of Acts church, and I know God loves me, but I was beginning to think something was wrong with me, b/c our whole church was receiving words of knowledge whenever we gathered on Sundays and Wednesdays. But, when I went forward to receive, our Pastors, (who are truly anointed and bear good fruit), had no word for me. I am a faithful servant, but I was getting desperate. The prophetic word that I received yesterday was right on target. It helped to revive my soul, and God is truly my all in all.!!! NOTHING IS IMPOSSSIBLE FOR HIM. Thank you!! This is something I had been wondering about. Thank you for all your posts!! Very inspirational and good for me. We are struggling these days with several things, beginning to not know what to do. Wow right on target ??? ?what a great word God has implanted in you Jamie? ?Thank you for sharing ? ?I truly feel blessed????? ?God is great soooo great ???????? The word of God says we should ask and it will be given, seek and you will find, knock and it will be opened. Everything that we ask in the name of Jesus and believe that it has been accomplished, so will it be. So as far as we haven’t received, we have to continue with asking and believing. May the Lord bless us all to the glory of Jesus name. Thanks for this Jamie. I want to encourage everyone. Things may not come when you want them to but they come right on time. Just keep trusting and believing in him.